One of the reasons that Fett hides his face is that it is the face of the clone wars, a secret best kept on the downlow. It's alright that Dengar and the others saw Boba's face because it was beyond Fett's control, and because their not old enough to realize the connection, (though that's arguable, I'll admit). I think it was genius to make Fett the clone material, Lucas's moment of brilliance. It's also too cool that Dooku finished raising Boba, and never trained him in the Force, even though Fett is force sensitive. How is Fett Force-sensitive, and when did Tyrannus raise him? I agree. When did Dooku ever raise Boba? Dooku took Boba in for maybe a day or two but abandonded him right after that. As for being Force sensative, years ago I wandered back and forth thinking he was and wasn't. But even when I thought he was I always figured it was very low. As in he's only a hair above the average person. I didn't even know Dooku took Boba in at all---what book/comic is that information in? I'd like to read it if I can get a hold of the material. It does seem only natural since Jango was working for (well, "working") Dooku at the time of his death. As for force-sensitivity, I had never heard of Boba being force-sensitive, though it would be an interesting twist. I just like how some characters had seemed to never even thought of wanting to see under the mask. Most are transfixed on the mask and what it represents, they don't care about his actual face--the mask is intimidating enough without looking into the actual eyes, the cold glare of the most infamous bounty hunter in the galaxy. Oh--the pic--shouldn't he be holding his rifle with his right hand? And no, I too agree that he wouldn't take his helmet off to greet Lando, but still a well-drawn pic. Ahh okay--thanks! I don't have any of those books yet. Actually, Boba IS Force sensitive. Its far higher then a normal person (why else would he be as good as he is? ), but its not as high as the Jedi level. So training him would be pointless anyways. Where was that stated? As hor him holding his blaster in his left hand, it is possible that he is ambidextrous. Yeah, as far as I know it was never actually stated that Boba's Force Sensative, so I'm curious about that too. We also see Boba Fett unmasked in Star Wars tales, remember? Also, he is unmasked in New Jedi Order: The Unifying Force, when he introduces himself to Han Solo under the false name of "Hurn". I too am curious about his force-sensitivity...? I have never heard anything about him being force-sensitive. Otherwise every clone trooper would've been force-sensitive as well, since the only difference between them and Boba was behavior modification and rapid aging. And Dooku didn't raise Boba, either. Like Miba was saying, it's in the first two young Boba Fett novels, but he didn't stay with Dooku long at all, after being delivered there by Aurra Sing. A a few days, at best. He pretty much escaped as soon as he could, when the Republic attacked his stronghold. That's how Boba ended up with the Republic orphans for a while. Admittedly, I haven't read the second of the Young Fett books, so I didn't know that he didn't stay with Dooku for ten years. Thanks, Miba, for helping with that. About his Force sensitivity, I saw a write up of Boba Fett for the Star Wars RPG, (the original pre-d20 system), long ago, and he was listed as untrained but with nine dark side points! So this means that whenever he wants to excell in something, all he has to do is get pissed off, which is hardly a change in his normal behavior, and exert his will. It is an inert, latent ability for him, that he doesn't really understand. Conan the Barbarian had latent psionic talents (wild empathy and a danger sense) in this fashion. For those who don't know what a dark side point can do when used, it can effectively double, or even triple, your effort to achieve something. The clones minds are tampered with, so perhaps they can't access their abilities in the Force. Perhaps this means that they don't even have the sensitivity any longer. I can't fairly speculate on it without reading all that's written on the subject, but it makes sense to me so far. The old Star Wars game didn't rate Fett's level of sensitivity as compared to what's needed for Jedi/Sith training, but that's because it just wasn't part of the game. You either had it or you didn't, and it was a skill to be developed through experience and leveling. Nine points was a lot of power to play with! Please excuse my wandering far off the topic. Don't worry about it. I think this would make a great topic for discussion. I'll start it off in another thread [Do you think Boba Fett is Force sensitive and why?] for all who are interested. And welcome to the boards, John. Yes, the exact one I thought it was. Do you see hs head turned ever so slightly? Thats Fett. And do ya see his glairing eyes? Thats Fett. Everything about this pic tells me that this is Boba's face! SOO TRUE SOO TRUE......that is an awesome pic.....and you're right about that tilting the head thing....one of Fetts habits. 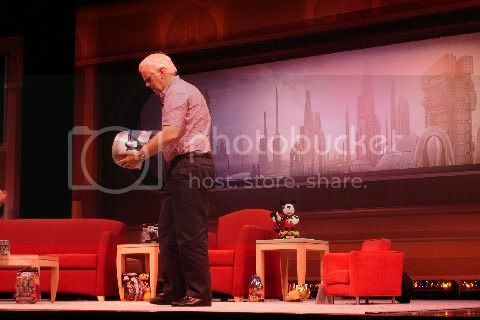 This was taken at the recent Disney Star Wars shindig. I thought it was a very nice nod to the scene from Attack of the Clones. Enjoy. Hmmn... Is that Jeremy Bulloch? Yes. For more on Jeremy, please see Ask Jeremy and JeremyBulloch.com. haha! more advertising. AARON!! PLEASE CHECK YOUR EMAIL!!!! I sent you the song!!! Email me back or something, dude!!!! Thanks for the sites, BFFC Admin. They're just what I've been asking for at Xmas since the Battle of Endor.